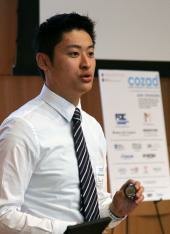 The 12th annual Cozad New Venture Competition featured the best of student startup innovation, with 13 prizes being awarded to help further promising student ventures. The competition, administered by the Technology Entrepreneur Center (TEC), featured a record number of more than 80 team participants, culminating in semifinal and final rounds of judging at the end of March. Serionix won the biggest prize of the weekend, being awarded $15,000 for being the Most Fundable Venture. The startup produces filter materials that removes chemicals faster than conventional technologies. (l to r) TEC Asst. Director Jed Taylor and Masha Trenhaile, Fox Development Corp., present the Most Fundable Venture Prize to Seritonix teammates Jim Langer and Weihua Zheng. “The cash prize is going to be used for patent applications and business development activities such as traveling to meet with potential customers and partners,” Serionix co-founder and materials science and engineering graduate student Weihua Zheng said. Serionix first developed from last year’s Cozad Competition, when the company failed to make it to the final round of judging. A year later, stronger organization and a clearer direction propelled Serionix to the top of an impressive group of contestants. The competition also featured prominent alumni who spoke via skype to the contestants, including Red Hot Labs and Farmville co-founders Amitt Mahajan and Joel Poloney, and former Google Vice President of Engineering Max Levchin. GlucoSentient's Brian Wong makes his pitch to the judges. he competition was judged by a record 13 judges in the semifinals and nine judges in the final round. GlucoSentient won the second biggest prize of the competition--a $10,000 prize for being named the Burrill Best Digital Healthcare Application--and the Cozad competition provided an opportunity for GlucoSentient to get feedback from professionals and validate its business idea and plan. GlucoSentient seeks to improve the lives of asthma and chronic obstructive pulmonary disease patients through simple, low cost home monitoring. The startup was one of many with not only a viable business plan, but also a socially responsible mindset. SERIONIX, which has come up with filter materials to remove perchlorate from drinking water, took first place in the Most Fundable Venture category, earning the firm $15,000. HigherMed, which won a $5,000 prize for second place in the Most Fundable Venture category. That team plans to develop and market an easier-to-use prescription pill bottle cap, primarily for people with decreased dexterity. StudyCloud won a $2,000 prize for third place in the Most Fundable Venture category. StudyCloud is an online collaboration platform poised at integrating social web technology with online education. 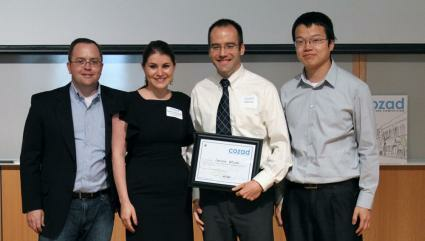 GlucoSentient, which won a $10,000 prize as the Burrill Best Digital Healthcare Application. GlucoSentient aims to improve the lives of patients with asthma or chronic obstructive pulmonary disease who take theophylline. It proposes home monitoring through use of a blood glucose meter. Transplants Without Donors, which won a $7,500 prize as Best Social Venture. That team invented a life-saving therapy based on the creation of artificial organs from the patients' stem cells and biomaterials. Oso Simple Technologies and Prawg each won a $2,500 prize for Best Mobile Application. Oso Simple aims to reduce the water used on lawns and gardens, while Prawg focuses on real-time interaction between TV shows and their audiences. Prawg also won a $1,000 prize for Most Patentable Idea/Venture. Contact: Jed Taylor, assistant director, Technology Entrepreneur Center, University of Illinois at Urbana-Champaign, 217/244-4035. Writer: Jay Lee, Engineering Communications Office. If you have any questions about the College of Engineering, or other story ideas, contact Rick Kubetz, editor, Engineering Communications Office, University of Illinois at Urbana-Champaign, 217/244-7716.